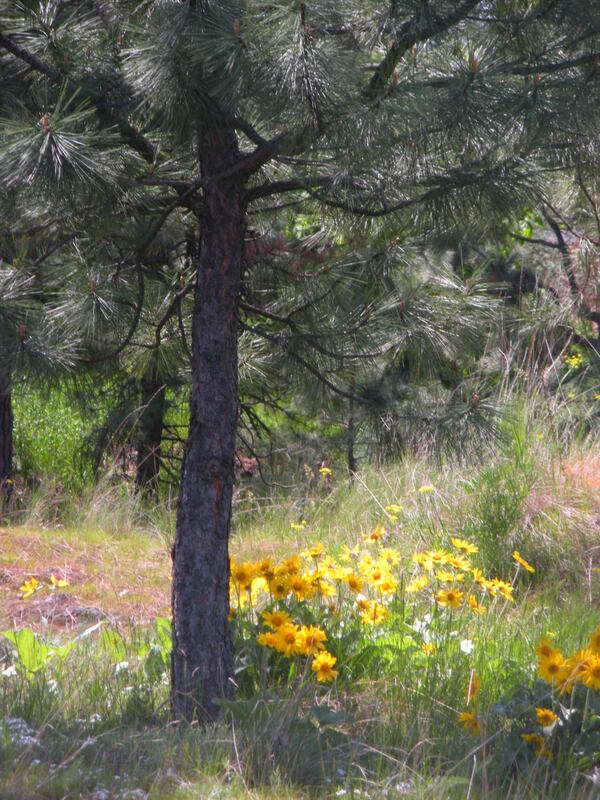 The wind has been blowing pollen* from the trees; with every gust, a cloud of yellow blooms from the tops of the evergreens. The spring rains follow, clearing the air for a respite and leaving evidence behind in puddles — and places where puddles have been. *MusicMan has been living on Benedryl since he came home from college for the summer. It’s the first time he’s experienced these particular pollens; he’s never lived here before, and these past few weeks have been doozies when it comes to allergies. The goal of My Town Monday is to show off some highlights of the city in which I live. There are so many places of interest around town that I could share with you (and I will, I promise! in time…) but I keep looking over my own back fence. I haven’t been able to go for as many walks this spring as I had planned on taking. My feet troubles have been, well, troubling me. The last time that I “overdid it” was the act that sent me begging for a podiatry appointment. Cortisone shots in my left heel have brought small doses of relief but the effect seems to wear off rapidly, leaving me frustrated. The doctor has been saying the S-word but I am not ready to go there yet. I’ve got some mental hurdles to get over first — and more importantly, an August wedding! So I take my Ibuprofen as prescribed and hold off any surgery until the icy winter keeps me off the streets. I took these photos over the course of several days in May. 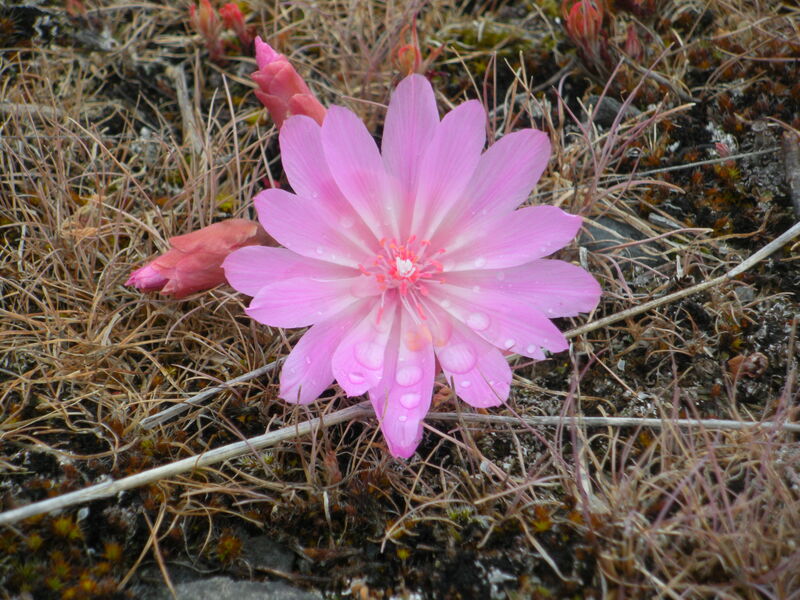 My walks were with some sun, some clouds, and some wildflowers freshly kissed by raindrops. 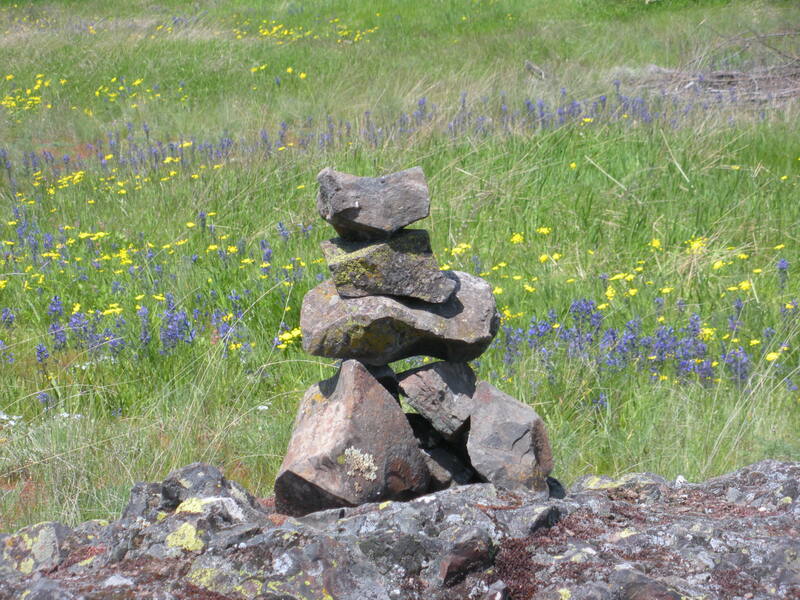 This entry was posted in My Town Monday, Photography, Seasons, Spring, Welcome Home by Karen (formerly kcinnova). Bookmark the permalink. The sights over your back fence are beautiful! I am sadly heavier than I have EVER been. I started going to Curves again. But my neck still feels out of whack and I have aches all over, I don’t think from the exercise. I may ask my cyling son to set my old bike up on his trainer. I envy his racing bike — I can lift it with one arm! Oh, the pollen has been bad here too. The cars are yellow! 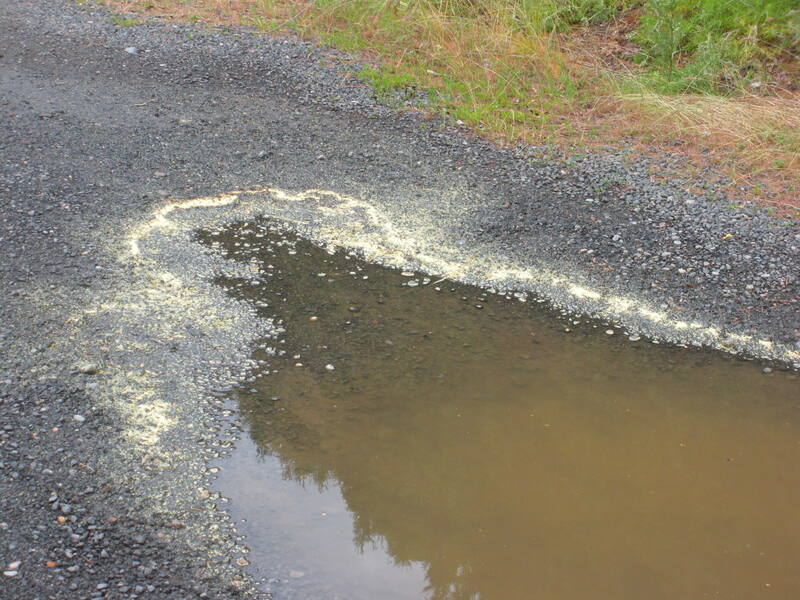 We have a yellow stripe on the street in front of our house, the thickness of a normal, painted yellow stripe but in the butter-yellow of pollen and much closer to the curb where the water flows after a rainstorm. Our black mailbox needs to be wiped off every day, so you have just made me grateful for the ability to park our cars in the garage! Oh these are wonderful photos. 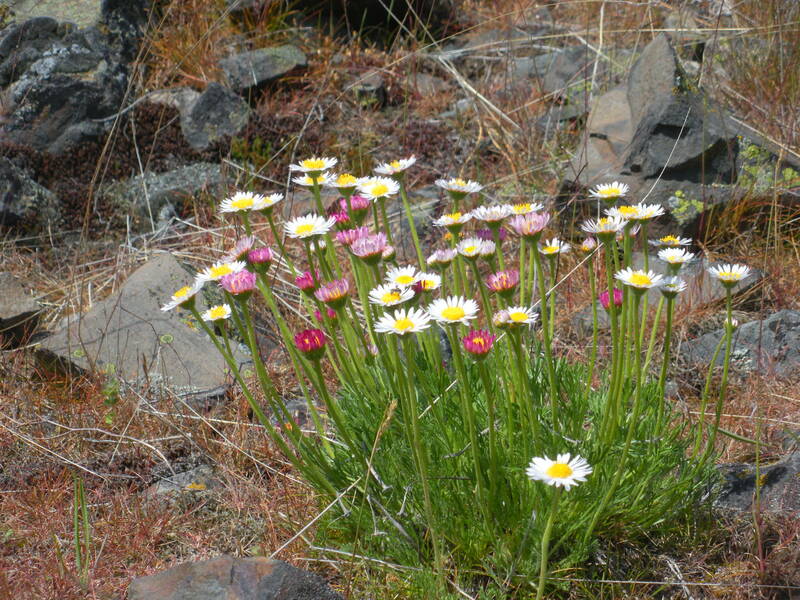 Such beautiful colours in the wildflowers. I hope your foot begins to feel better soon. Some spectacular flowers I’ve not seen before, Karen…really beautiful. Take care of that foot and you are smart to wait until winter to even think about foot surgery. As one who just had foot surgery this past winter it’s a bit slower recovery but well worth it when you are up and going again. 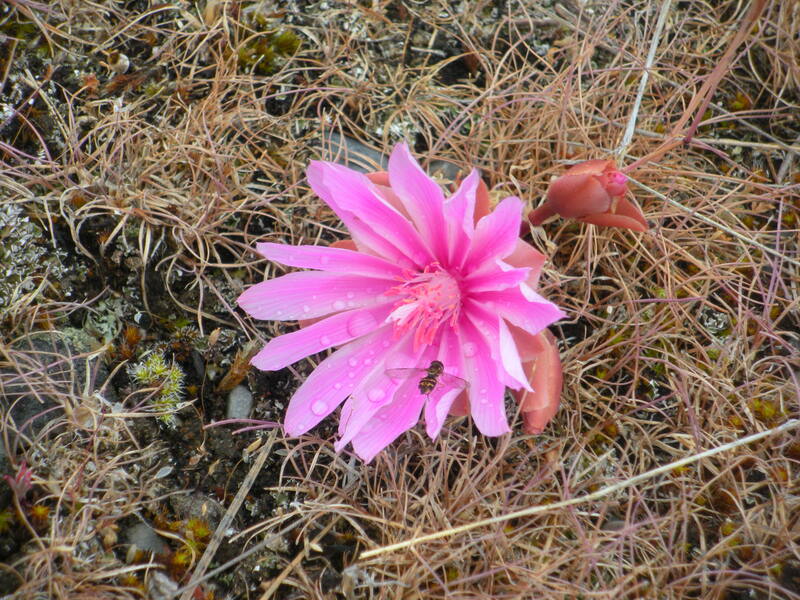 the colors that you encounter on your walks are just wonderful!!! the yellows…and pinks…and blues….so very nice. the allergies here in our house are mainly due to “house dust”…yeah….good luck with that one, right ?!? ! hahaha!! 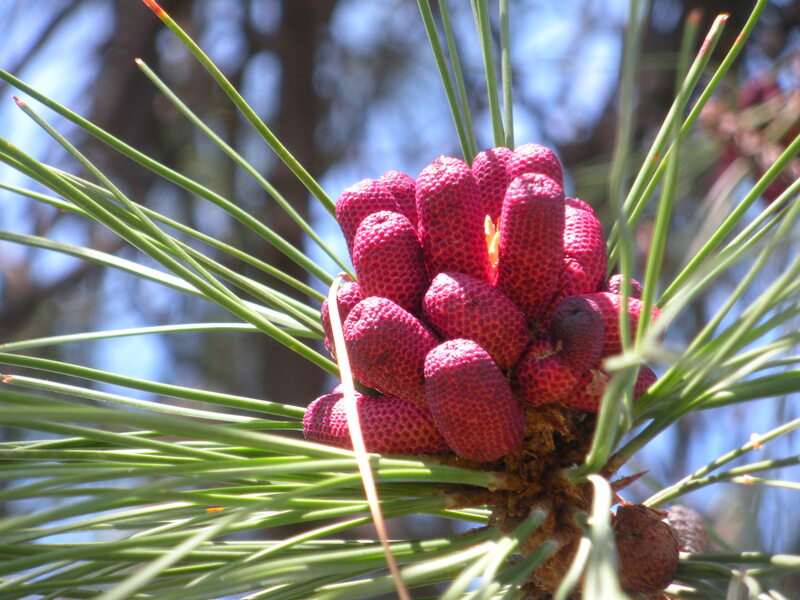 one of my students was saying that this year was THE worst year for allergies….not sure why, but many people were absent from my classes because of what’s flying around in the air!!! I just found out this morning that the youngest boy has allergies, too — which explains a lot of sneezing that I was blaming on his bunk full of stuffed animals (although if dust is the culprit, I can still blame those critters). Love the pictures. What a beautiful area you live in. Sorry about your feet, that must be so frustrating! But biking is a good alternative and if you can do that pain free, go for it! sorry for your soreness and those allergies, but your pics are really quite beautiful indeed! You have such a skilled eye. 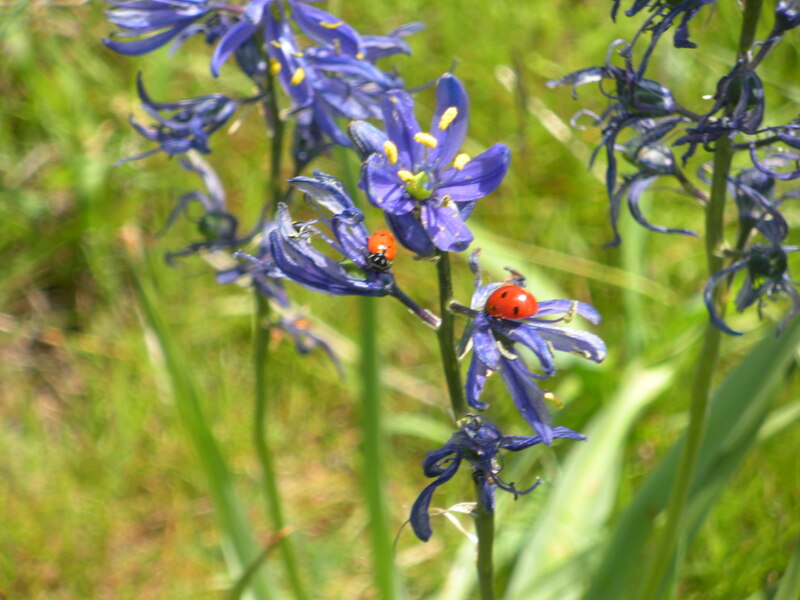 The Iris with the ladybugs is breathtaking. Hope your sore dogs are feeling better soon. Our snezson is just starting, no yellow puddles yet, but the white fluff in the air has begun and will get a lot worse in the days to come. I wore hard molded orthotics for my feet for several years, then realized a couple of years ago that I was not needing them. Sadly this year I need them again, good thing I rarely throw things like that away. Bad thing, my right foot is swelling because of the hip surgery and my lymphoedema, so I don’t really want to wear my sneakers and tie my foot into a shoe that allows no room for expansion. I’m beginning to question the wisdom of podiatrists. That happens to my son, too, now that he’s going to school in the UK. Our pollen is oak pollen – when it’s really blowing, the tops of our cars look chartreuse! 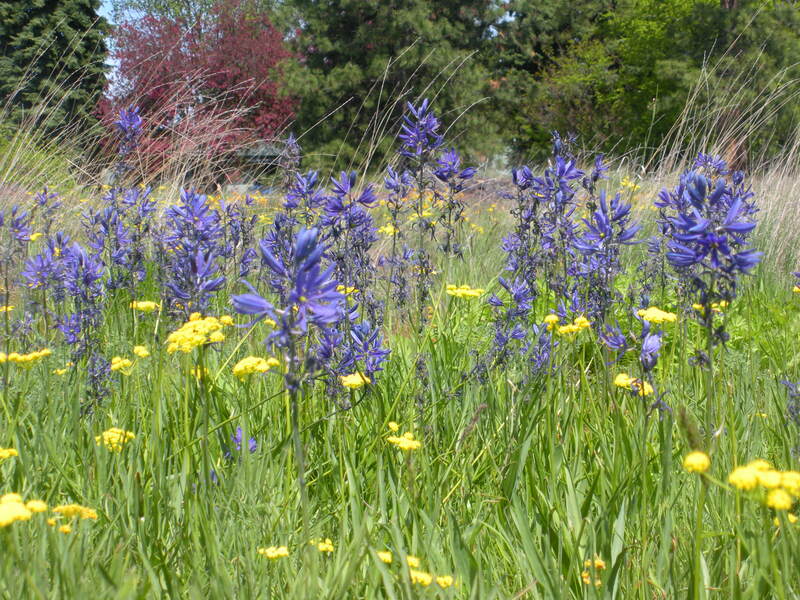 Love the flower photos – and because I am such a grind I’ll give you their names – the blue flowers at top are Camas, or Camassia quamash – native wildflower of the northwest that was used as food source by the native peoples. 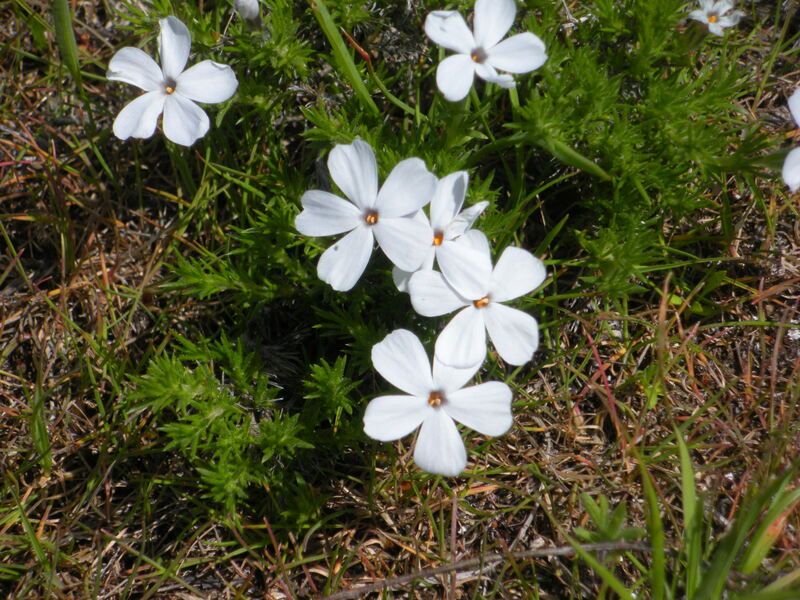 The white is Phlox viscida, or sticky phlox. We have one similar here in Southern California that has pale pink flowers. 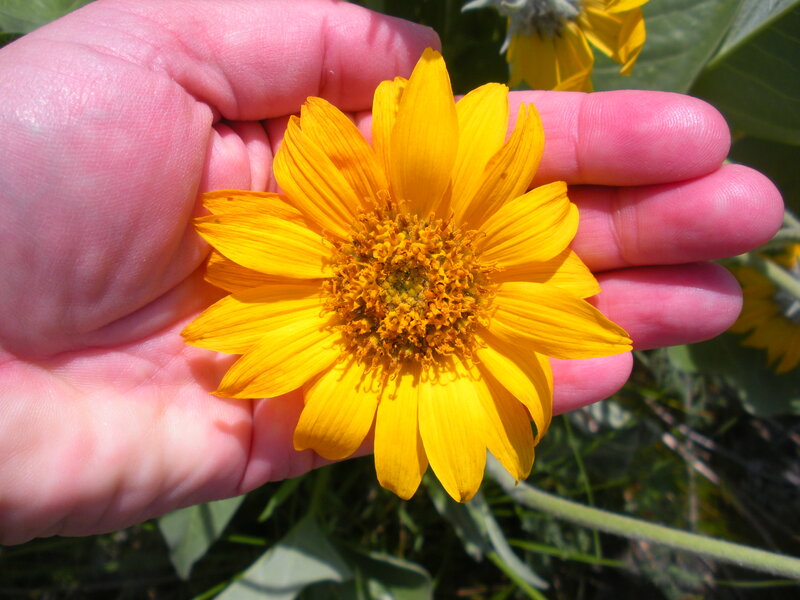 The yellow is balsamroot, or balsamorhiza – not sure exactly which species since I can’t see the leaves in your photo. 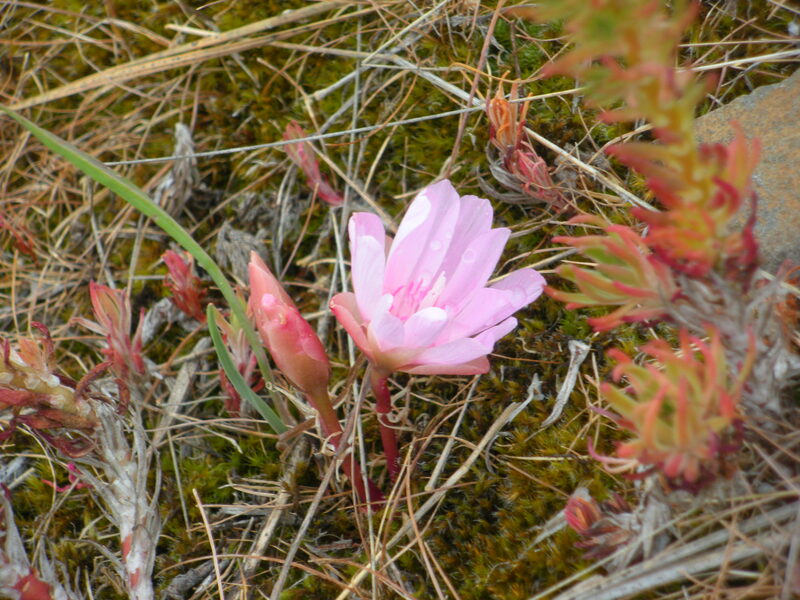 And the beauty at the bottom – for which I truly envy you – is Lewisia rediviva, or bitterroot. Are you and your son using a Neti pot? It made a huge difference in my life. These flowers are right over your fence? Lucky you! (And thanks Aunt Snow for the names!) Hope your foot feels better soon so we get to see more of your town photos.